I have been a ham since 1981, and received my Novice license while I was a senior in high school. I grew up listening to distant AM broadcast stations and became an avid SWL when I acquired an old shortwave radio. I still hold my original call, KAØLDG, and never really saw the need to change it. I slowly worked my way up to Extra over the years and am quite active chasing DX when I have time. My volunteer experience with the League goes back to 2001, when I took over as the Section Manager for North Dakota, where I continued to serve until 2008. In 2010, I was appointed as the Dakota Division Vice Director. I served on the Field Organization Sub-committee, Ad-Hoc Committee on Scouting and have been a member of the Programs & Services Committee. 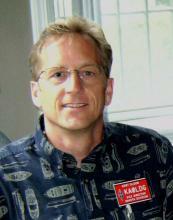 I was also the Board of Director's liaison to the ARRL's Emergency Communications Committee, which was just disbanded. Most recently, I served as the Board's liaison to the RF Safety Committee. I now serve Dakota Division hams as your new Director. I'll be on the Program & Services Committee and the Ethics & Elections, Committee. I look forward to promoting and advancing amateur radio not only in the Dakota Division, but throughout the country. I am involved with the Red River Radio Amateurs in Fargo, having served in all major leadership positions as well as helping with emergency communications. I have taken all three of the ARRL's Emergency Communications Courses and have put that knowledge to work with past flooding of the Red River. Currently I am the Wing Commander of the 119th Wing in Fargo, ND. The 119th Wing is an Air National Guard (ANG) unit tasked with providing trained and ready airmen to deploy where the Nation needs them and to help in domestic response throughout North Dakota. I have served for more than 35 years in the NDANG, mostly as a pilot having flown aircraft such as the F-4, F-16 and most recently, the C-21. In both the F-16 and C-21 I had the privilege of operating aero-mobile since both aircraft were equipped with an HF radio. Obviously, the times I could use it were few, but enjoyable nonetheless and thus I know what it feels like to be on the receiving end of a pile-up. I am married to a very ham friendly wife who allows me to delve deep in my favorite hobby. We have two boys who have their ham tickets and keep us busy with their school, Boy Scout, and other activities.